Additionally, Spotify’s update enables better syncing across mobile platforms, including the ability to sync with local folders and the iTunes library. This software update was the culmination of a series of announcements — a mid-April update to the Android app, an update to the Apple iPhone Spotify app and the introduction of iPod syncing capabilities. 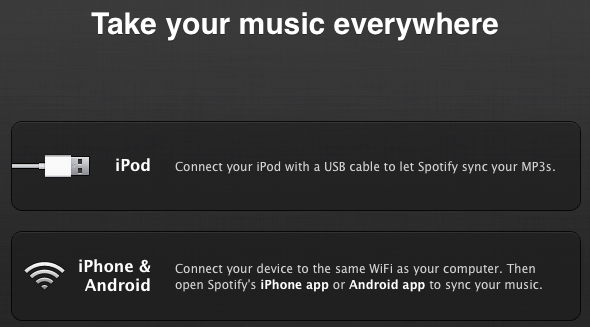 All of these improvements allowed any of the above devices to sync a user’s chosen playlists (or entire Spotify library) over the internet. Streaming via Spotify mobile is only available to premium subscribers who pay $9.99/month or between £5 and £9.99 in the UK (as it always has been). Spotify also introduced a limit of 10 listening hours of music monthly for its free users last month, in addition to allowing five listens per track. Over the weekend the response was mixed, however, at some point on Sunday, Spotify’s servers apparently went on the fritz. And the varied tone of user comments on Spotify’s Friday Facebook post shifted to concern. Music could be streamed, but nothing could be downloaded — and syncing was working intermittently. UPDATE: As of Monday 5/9, syncing is now working and the error message above is on longer appearing. However, the desktop interface is not recognizing the device as it did on Saturday (see image below). 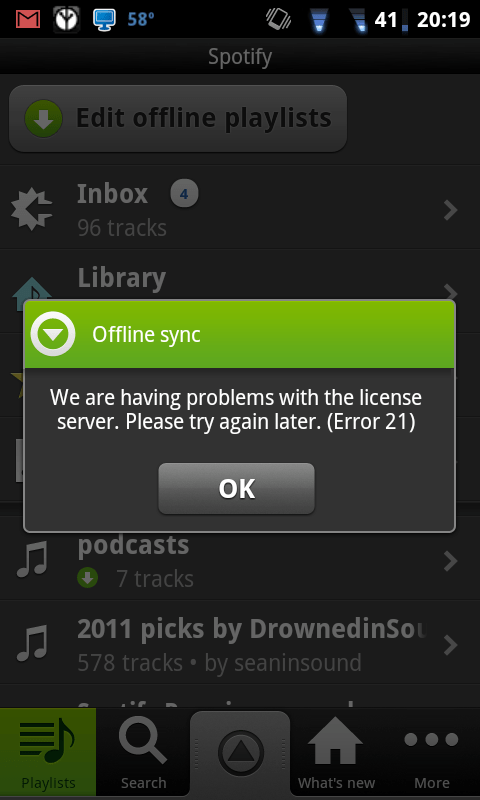 The latest Spotify software update introduced this handy syncing interface (PC36100 is the codename for my HTC EVO Android smartphone). It does appear that something remains on the fritz as I was unable to download any tracks earlier, instead receiving the message Having purchased 15 downloads for $12.99 (which breaks down to $10.82 plus 20% tax [VAT]) I was anxious to download at least one track. After unsuccessfully clicking the download icon next to several tracks in the Spotify interface only to receive the message “The track you were trying to get is unavailable,” I finally succeeded with “Little Pink Plastic Bags” from Gorillaz 2011 “The Fall” album. As promised, I received a 320 kbps mp3 file in my local directory. As Monday breaks across the pond I hope to hear something from Spotify. We’re coming to expect only bad news when Internet-based applications and services suffer server setbacks and outages and users are left hanging out to dry (see Sony Playstation). Assuming everything is resolved there may no longer be any need whatsoever for a Spotify user to open iTunes. Ever. Again. With over 10 million users in seven countries — Finland, France, Norway, Netherlands, Spain, Sweden, United Kingdom (1 million paying subscribers) Spotify is still not available in the U.S.in spite of its arrival seeming imminent since soon after its launch two years ago. 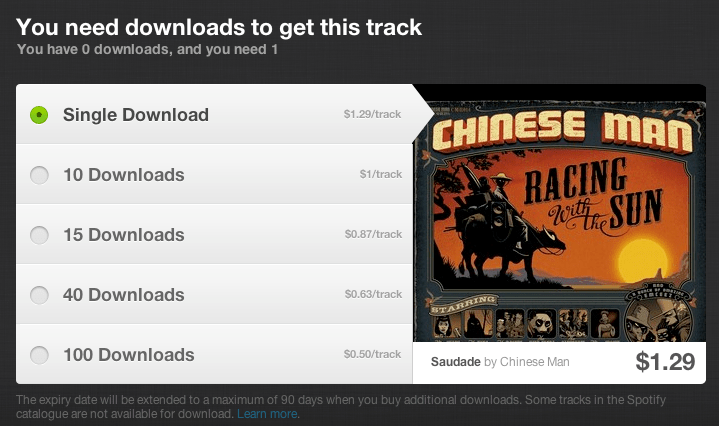 Next PostNext Spotify MP3 Downloads: Better than Amazon and iTunes?